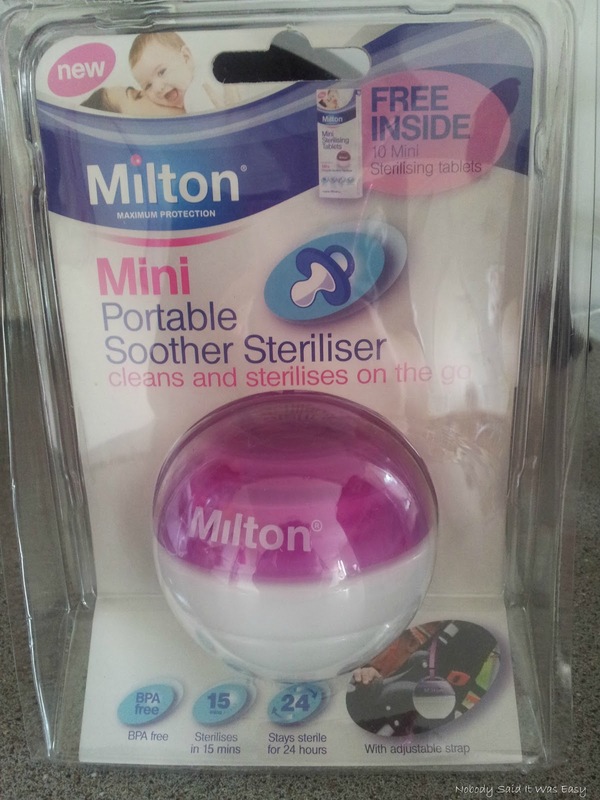 The Milton Mini portable soother steriliser is a brand new product from Milton for cleaning & sterilising on the go. Anyone who takes a dummy out & about will know how frustrating it is when the dummy is spat or pulled out, but you can’t give it back because it’s been on the floor, so you end up having more than one with you. Now there is no need to take more than one dummy. 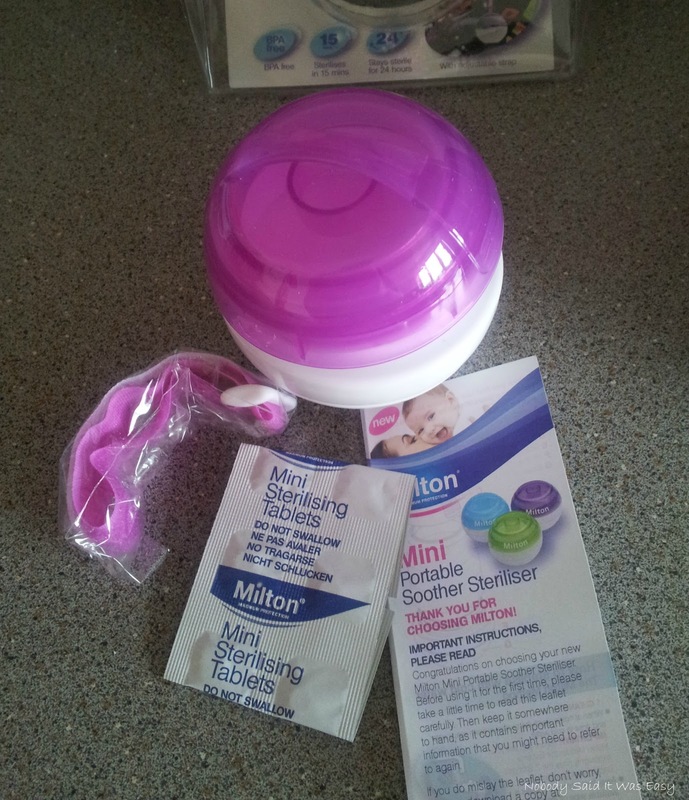 In the pack you get the Mini, a carry strap, instructions, and 10 sterilising tablets to start you off. The instructions are very straight forward to follow, so after the first time using it you won’t even need to read them again. 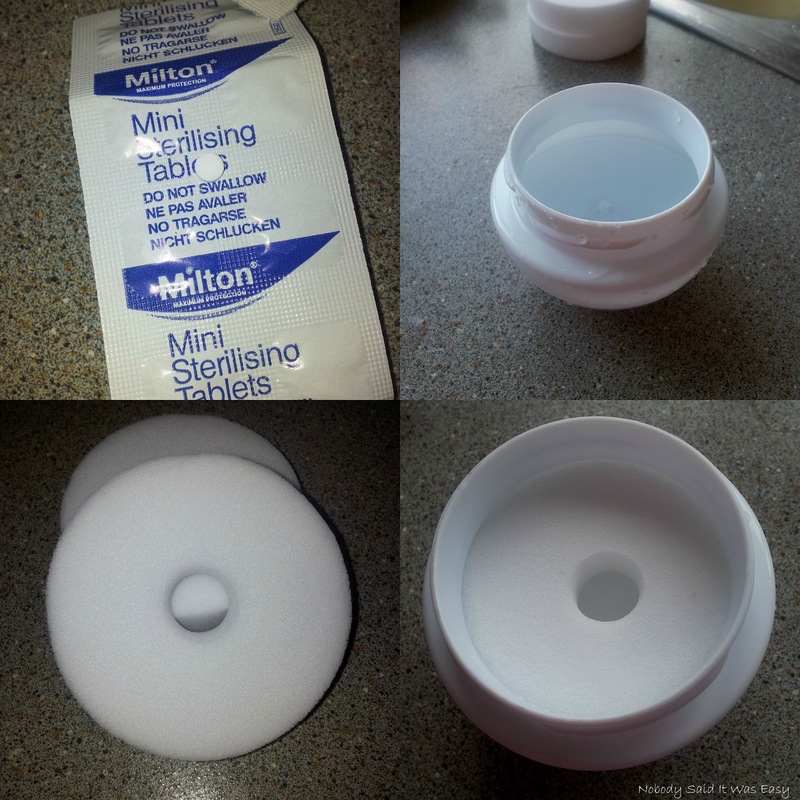 You just fill the Mini with water, add the tablet, let it dissolve, add the sponges and then in goes the dummy and screw the lid on. The Mini is then ready to use after just 15 minutes. 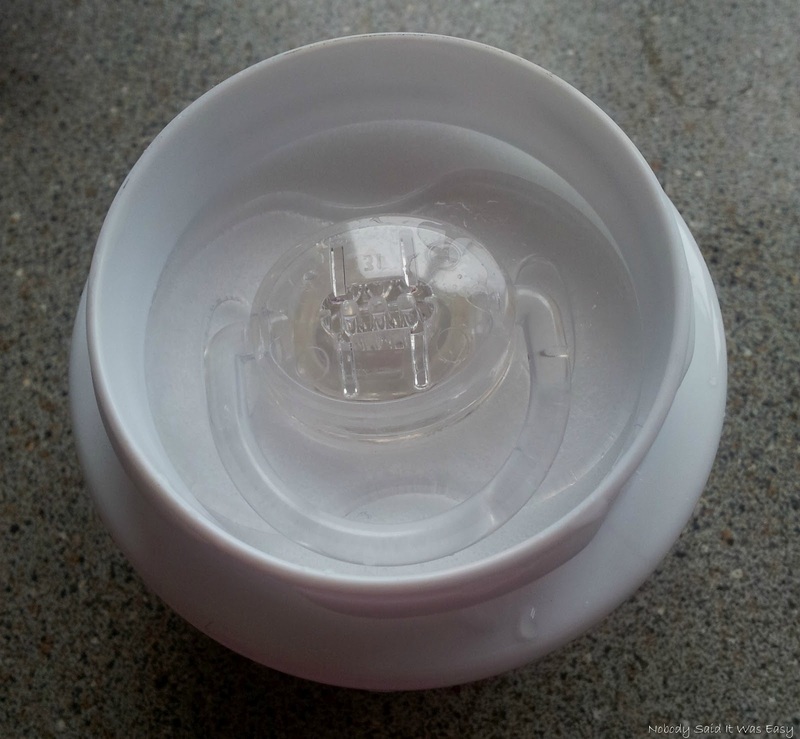 The unique sponges absorb the solution so there are no spills, plus it helps to remove dirt from the teat, so no need to rinse. The Mini stays sterile and reusable for 24 hours, so is incredibly handy for long journeys, or even to take on trips away or holidays. The carry strap will attach to practically anything, so the pram frame, car seat, handbag, or changing bag, to name but a few. This ensures you always have a sterilised dummy directly to hand. 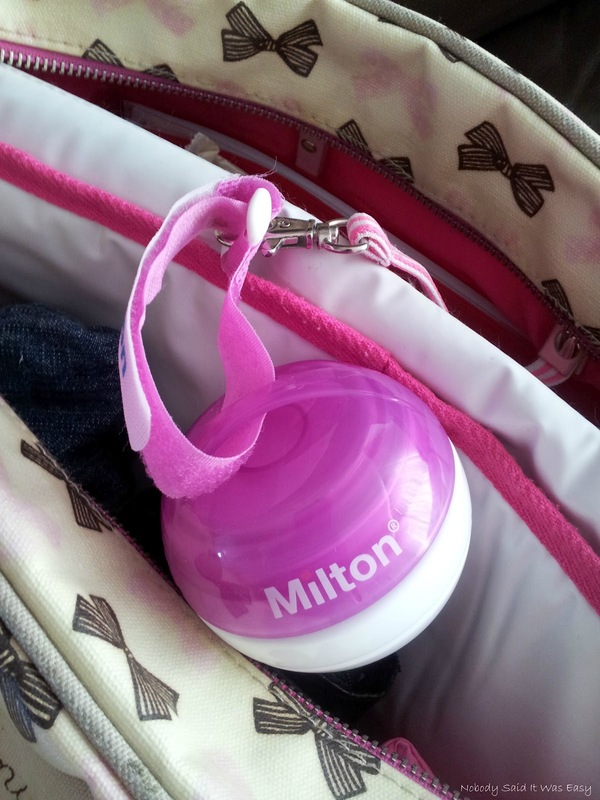 We took it out on an adventure yesterday and attached it to the clip inside of my changing bag. The Mini comes in 3 different colours, the lovely purple shown here, and a fantastic blue & green. It retails at £6.99 at a variety of stores, and stockists can be found here. I was sent this product free of charge to review, but all thoughts & opinions are honest & my own.